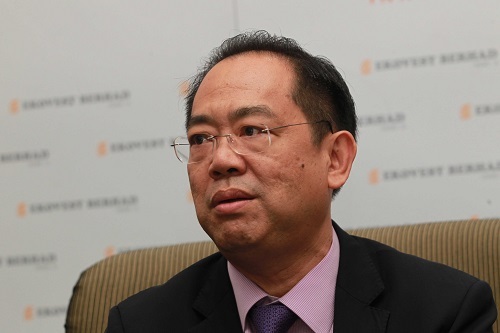 Ekovest Bhd's wholly-owned subsidiary Ekovest Land Sdn Bhd aims to launch Eko Titiwangsa phase 2 in mid-2017, said Ekovest managing director Datuk Seri Lim Keng Cheng. Eko Titiwangsa in Titiwangsa, Kuala Lumpur comprises three blocks of freehold serviced apartments with a total of 696 units with built-ups ranging from 820 sq ft to 1,340 sq ft. Phase 1 of the project with 270 units was launched in June 2015. Speaking after Ekovest’s extraordinary general meeting today, Lim said the company will adjust its upcoming property launches according to market demand. The project is located along Jalan Pahang and DUKE Highway 2. It is also accessible via Jalan Tun Razak. Eko Titiwangsa residents will have direct access to the carpark area via the upcoming Duta-Ulu Kelang Expressway (DUKE) phase 2 which Lim said will be operational and toll-able by 1H2017. "There is no delay for Duke 2 and we have started inspection activities with the authorities. "For the Sri Damansara Link, all that's left is the toll plaza while for the Tun Razak Link, it's 95% completed," he said. He also disclosed that Eko Cheras Mall is slated for completion by this year end. Meanwhile, Ekovest has obtained unanimous approval from its shareholders for the proposed disposal of 40% equity interest held in Konsortium Lebuhraya Utara-Timur to the Employees Provident Fund (EPF) for a total cash consideration of RM1.13 billion. The proceeds of RM1.13 billion will be used to distribute a special dividend of RM0.25 per share to shareholders. "The proposed disposal is in line with the company's broad strategy to monetise its mature infrastructure assets to free up financial resources for the infrastructure division expansion and other core businesses, such as construction and property development. "We are glad that our shareholders share our vision to establish a long-term relationship with EPF through this corporate exercise, leveraging on the establishment of this relationship as a platform to pursue collaborations on potential investments in the future," said Lim.